Metal roofing in Menlo Park, CA is gaining popularity among American homeowners who are increasingly becoming aware of the material’s advantages. Roofing as one of the important components in home construction and maintenance for its defense value against the elements is enhanced further by the properties of metal roofing. Some of the main advantages of using metal roofs are detailed in this excerpt from S.E. Slack’s article on the Aurora Advocate. “While traditional asphalt roofing materials have a life expectancy of 12 to 20 years, State Farm Insurance states that a metal roof can last as long as 70 years, depending upon the quality of the metal used. They can also withstand wind gusts of up to 140 miles per hour, which is highly desirable in tornado-prone locations. 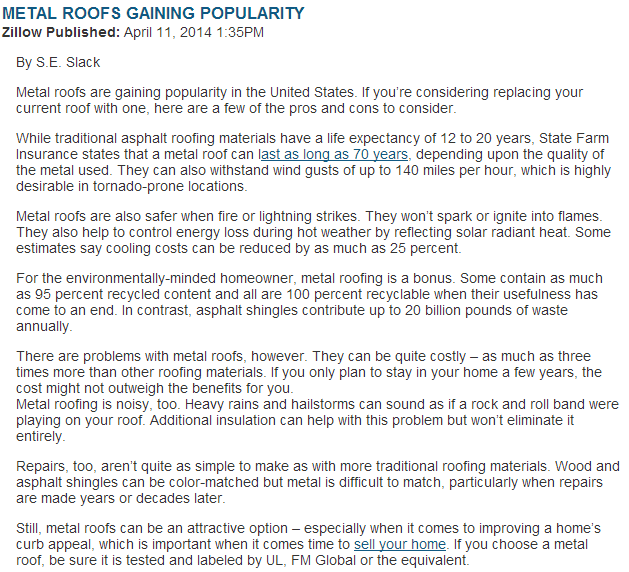 Using metal for roofing in Palo Alto, CA and other sunny locales is proving to be a boon. It is common knowledge that metal, upon contact with heat, acts like a mirror which reflects heat instead of absorbing it fully. A recent study conducted by the Florida Solar Energy Center has shown that metal roofs fare better than asphalt shingles in terms of heat insulation. The study revealed that asphalt shingles absorb more heat, which doesn’t just settle upon the roofline, but streams and penetrates the structure, increasing indoor temperature by 20 to 25 degrees, a surge that could make a room feel so stuffy and oven-like in tropical California. Metal roofs, on the other hand, are upgraded and designed to reflect heat away, allowing indoor temperature to keep its balance—and saving homeowners as much as 50 percent in energy bills. They can also get 100 degrees cooler on the surface than their counterparts, according to the Midwest Roofing Contractors Association (MRCA). Asphalt shingles curl and buckle over time, weakening their barrier function and resistance against the natural elements, such as severe wind force and rain. Additionally, maintenance becomes more frequent and expensive over time, with premature roofing replacement as a real possibility. Some architects like Pi Smith in Vermont prefer metal roofing over asphalt shingles. “They look great! Very crisp and architectural and much easier to get excited about than asphalt shingles. Other than copper and slate, both very expensive, enameled standing seam roofs have the best longevity,” she explained. If you’re living in the Palo Alto, Menlo Park, or other Californian locales and are looking to have a metal roof installed for your home, contact only reputable and licensed contractors, such as Shelton Roofing, to ensure you get top-notch installation service and high quality materials.